Good morning fellow autograph collectors. 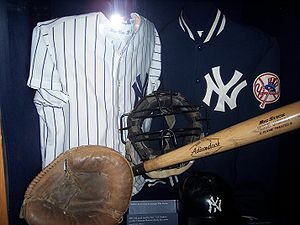 Today we are going to take of look at the signing habits of former members of the New York Yankees in the Baseball Hall of Fame. Some of these names are not long time Yankees, but did play for the Bronx Bombers for at least one year. Yogi Berra – This 86 year old legend is still a great signer. He doesn’t talk a lot but he will almost always sign at least one for collectors. Wade Boggs – He is also a very good signer in fact, he rarely turns down an autograph request. Whitey Ford – “The Chairman of the Board” is a class act. It is a rare day when he turns down a request for an autograph. A very nice guy and Yankee Ambassador. Reggie Jackson – “Mr. October” can be hot and cold. I have seen him so rude to collectors that you can’t believe your eyes. On the other hand, I have seen him very agreeable. It’s all moods with him (and if the press is there). Phil Niekro – The greatest knuckleball pitcher of all time is also a Hall of Fame signer. Even when he is mobbed by collectors he signs for everyone possible. Great guy! Gaylord Perry – This famous spitball pitcher is a very good signer. He oftentimes gets a bad rap because he does a lot of signings for pay, but he is great in person. Dave Winfield – He is very outgoing and a great signer. A very good guy who hardly every says no to an autograph request. That wraps up the New York Yankees. Feel free to check out my web store at www.autographedfirstdaycovers.com. This entry was posted in Uncategorized and tagged Antiques and Collectibles, Autograph, Bronx Bombers, Celebrity, Collecting, Dave Winfield, Gaylord Perry, Hall of Fame, National Baseball Hall of Fame and Museum, new york yankees, Phil Niekro, Reggie Jackson, Signatures, Wade Boggs, Whitey Ford, Yogi Berra. Bookmark the permalink.